Can you tell us about your job as a physiotherapist? I work for the East Lothian Adult Joint Mental Health Team. It’s a multi-disciplinary team which includes nurses, doctors, occupational therapists, social workers, peer support workers, and others. I work mostly with adults, trying to help them with their aches and pains as any physiotherapist would, but I also have a particular interest in using exercise to help people improve their mental health. Can you tell us about your recent fundraising event? I love cycling, as does my friend Fraser, so we decided to cycle Land’s End to John O’Groats for Alzheimer Scotland! Our plan was to be as self-sufficient as possible; taking tents and sleeping bags, and to avoid busy roads by using the Sustrans cycle network wherever possible. This added a few miles to the route, but kept it safer and probably a bit more scenic. We ended up cycling 1080 miles over 9 and half days, and ascended 45000 feet along the way. Everyone has been so generous in sponsoring us on our JustGiving page; in the end we’ll have raised well over £2000 for Alzheimer Scotland. What was the highlight of the name of the event in here? It was all amazing (now that our aches have gone) – but for me a particular highlight was the bit from Aberfeldy to near Inverness – I’ve seen the cycle path beside the A9 so many times, and always wanted to ride it: We had a tail wind that helped us up and through the Drumochter pass and the Slocht pass, with just amazing scenery all around. The difference between cycling this route and driving it is near indescribable – the sense of scale being probably the most memorable aspect. What 5 photographs capture your journey the most? Why did you choose Alzheimer Scotland to as your chosen charity? Fraser and I have a shared friend whose mum has Dementia, and so it seems so very close to home (our mums are the same age), and I think that’s the rub of it; that everyone we spoke to along our journey and everyone who sponsored us have been so generous because they all know or know of someone who has been diagnosed with Dementia. I am the Physio for the East Lothian Adult Joint Mental Health Team. I work in the community providing Physiotherapy assessment and interventions to a broad range of people who are in touch with secondary care mental health services. I also act as specialism lead across East and Midlothian, and work closely with my colleagues in Musculoskeletal, Inpatient and domiciliary Services. Three questions of my questions we were asked by the Scottish Dementia Working Group. The final question was asked at the Age Scotland member’s conference with colleagues Yolanda @Yol_ahp and Jenny @JennyAckland2. You can find out more about each profession on their professional body website. Each one of the allied health professionals have their own professional body, standards of professional practice and can be contacted directly. In our blog we include the links to these professional bodies in our “Useful Links” section. You will also find contact details of AHP services in your local health board website where there maybe be a list of what services are available. Here is an example in NHS Lothian. You will find a few of us on social media so you can connect with us there too. If you follow the hash tag #AHPDementia you will see some of us there. 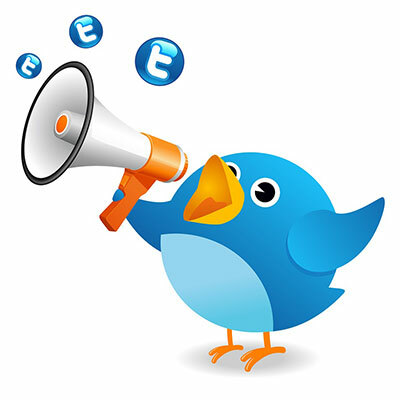 All our twitter handles are included in our contributors pages too. More specifically to what you are “entitled” to if you are living with dementia, you could also look at the Standards of Care for Dementia in Scotland. These standards have been developed to help people living with dementia and their carers understand their rights, and how these rights can help make sure that you receive the support you need to stay well, safe and listened to. The standards are based on your rights. You should use them to get the care, treatment and support you need. To ensure continuous improvement, the standards should be used in conjunction with Promoting Excellence: A framework for health and social care staff working with people with dementia and their carers. 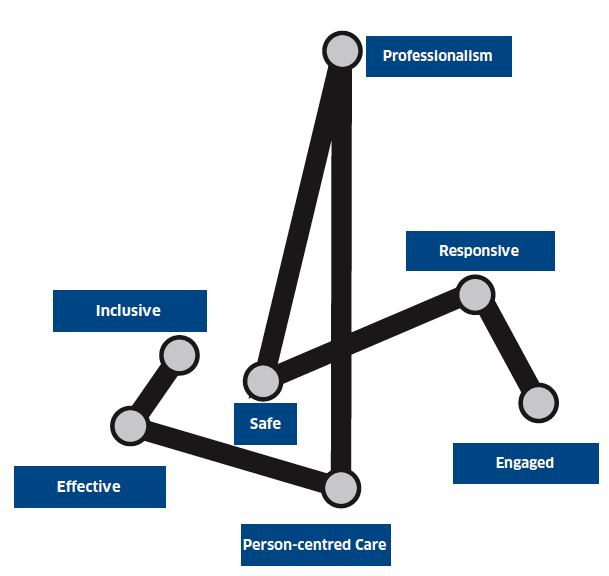 The framework outlines in detail the skills and knowledge health and social care staff should have depending on the role they play in supporting people with dementia. We aspire that all allied health professionals on graduation and in practice worked at the minimum of “skilled”. Allied health professionals build strong partnerships with other agencies, community providers and also other members of the multidisciplinary team both in the NHS and local authority. This will also include our community psychiatric nurses, district nurses and more recently the Alzheimer Scotland Link workers too. So yes we do have close links with the community psychiatric nurse who you can ask to refer you to an allied health professional in your local area. This is a question we are asked a lot and we have developed a new leaflet to help answer this question. Today we launch our Alzheimer Scotland allied health professionals leaflet, click here to access the leaflet. 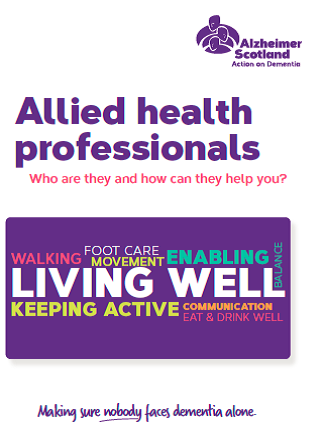 Over the forthcoming weeks, this leaflet will be available in all our Alzheimer Scotland resource centres and directs you to how to get in touch with five of the allied health professions including dietitians, occupational therapy, physiotherapy, podiatrists and speech and language therapy. We have many other allied health professionals not included in this leaflet as this leaflet was about those you are most likely to see in a community setting. Email us at TalkingDementia@alzscot.org if you would like to hear more about arts therapies, orthoptists, paramedics, prothetists, orthotists and radiographers (diagnostic & radiographers) in Scotland and we will and offer you a link to these professions too. What’s next in this week’s blog series? 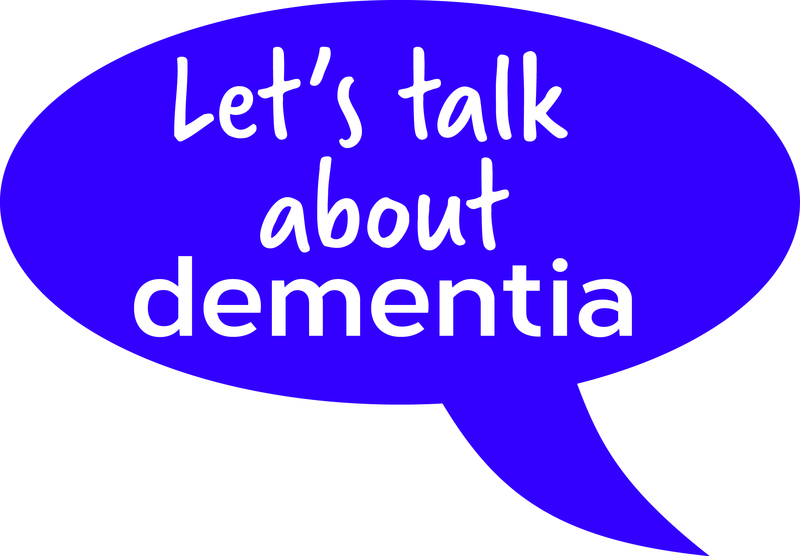 Finally, over the remaining four’s days, we have a Q & A series of real questions from people living with dementia and their carers being answered by members of the Alzheimer Scotland allied health professions dementia expert group so look out for them and please join in our “blog a day blether” for #DAW2015. We welcome ideas and comments from our readers this blog to any of the answers in case I have missed out anything. Tomorrow’s blog will be by Gillian and “Ask a Dietitian” Q & A.